Not far from Adobe Walls, mail was routed through that community when Jeffry’s post office closed in October 1918. The community had a school built in 1906 named after the man (Ben Holt) who donated the land. The enrollment was 57 in 1918 but only 7 by 1927. A cemetery marked Holt is shown on detailed county maps. 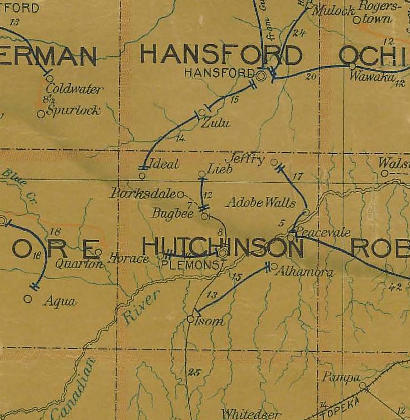 Delbert Trew’s article on Ghost Towns of Hutchinson County contains mention of Jeffry.